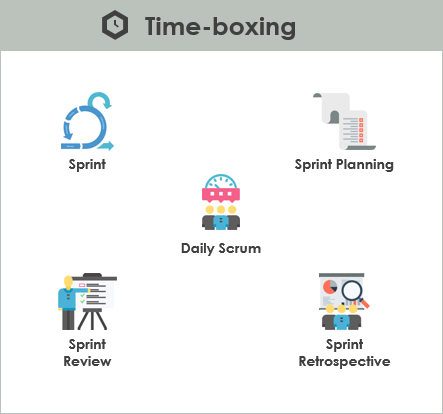 Current: What is Timeboxing in Scrum? The Timeboxing method is the best way to increase productivity and split projects into fixed periods. This time management technique offers the opportunity to limit the amount of time one wants to spend on a certain activity in advance. 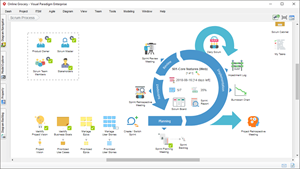 Under the Scrum framework, all activities are time boxed, also known as “timeboxing” or timeboxed, is to give a “fixed length” time segment to a specific event or activity. That unit of time is called a time box. The goal of timeboxing is to define and limit the amount of time dedicated to an activity. Scrum uses timeboxing for all of the Scrum events and as a tool for concretely defining open-ended or ambiguous tasks. 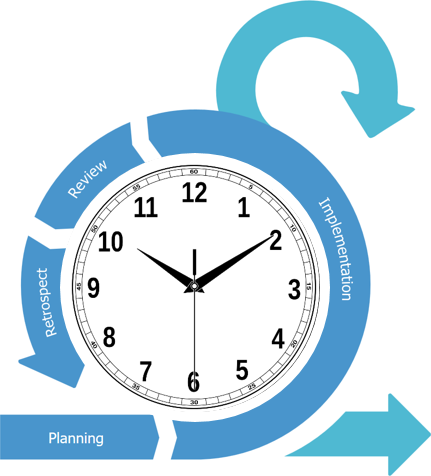 In Scrum, timeboxing is a critical component of all five events. Some Scrum teams also use timeboxing during a Sprint to concretely define open-ended tasks. An example of an open-ended task might be conducting research that is necessary for the team to reach a decision or to estimate the size and complexity of an upcoming story. Sprint Planning: The timebox should not exceed 2 hours / Sprint length is 1 week. Daily Scrum: The timebox should not exceed 15 minutes. Sprint Review: The timebox should not exceed 1 hour / Sprint length for 1 week. Timeboxing is a common feature of many project management methodologies because timeboxing keeps teams focused on accomplishing the task at hand by providing a clear definition of done. Priority: Priority is required for all matters that occur during the time. Focus: Let focus on the “most important” things under time constraints. Stop Loss: Let things have a stop loss point under the principle of time. Rhythm: Let time limit develop a certain sense of rhythm. Semi-finished products: not all work can be completed in time. Under the time limit, it will cause “semi-finished products”. Not speaking: The discussion may not be sufficient. Some people and some things may not be able to speak. Inaccurate: It may happen that the matter is quickly discussed or not discussed, and the time estimate may be “not allowed”. The goal of timeboxing is to define and limit the amount of time allotted for a specific activity. Timeboxing is the cure for preventing exceeding time limits. 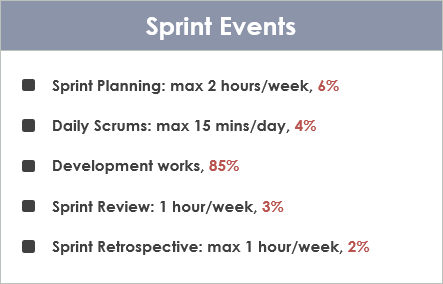 Scrum exclusively works with sprints; these are time boxes of one month or less, in which the scrum team delivers sprint goals. Scrum uses Timeboxing as a tool to concretely define open or ambiguous tasks.